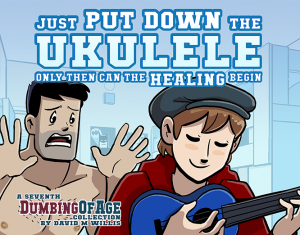 THE SEVENTH DUMBING OF AGE KICKSTARTER IS GO! Collecting (obviously) the seventh year of Dumbing of Age, this 228-page book’s also got strip commentary and 27 Patreon bonus strips! Also, hey, as always, character magnet add-ons. This year we’re starting out with Sierra, Amber, and Ukulele Danny! If/after we hit $50k, everyone who pledges for a paper book gets a Ruth magnet for freeeeeeeee! Are we going to be getting a DoA Penny magnet? Penny is still incredibly chill about the fact that Jason’s making demands while pointing a gun at her. 90% of being in control is attitude. Sal went from chill action hero one-liners to shouting death threats in remarkably quick fashion between yesterday’s strip and this one. This is the point when Penny should have realised that ‘implausible luck’ seems to be one of Sal’s attributes. I still can’t remember how/when Sal found out she’d been brainwashed. Jason told her, if I remember right. That was the beginning of this arc.